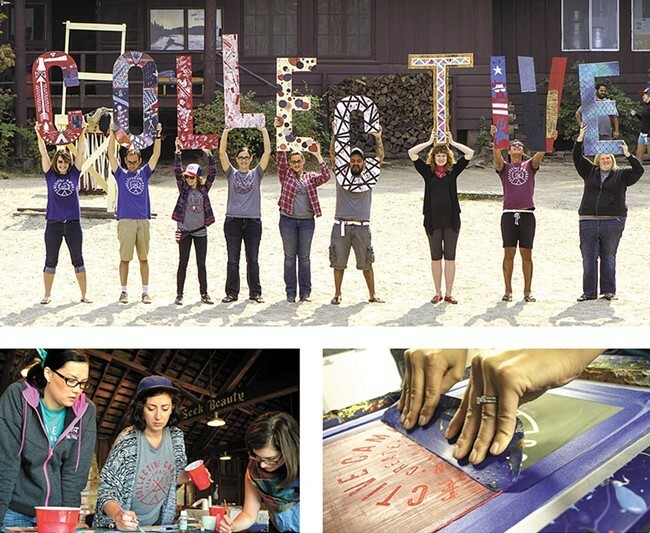 After a successful inaugural run last August, the Spokane chapter of the American Advertising Federation is gearing up to host the second annual Collective Campout creative retreat late this summer. Again set for the last weekend in August (Aug. 26-28), on the picturesque and historic grounds of Camp Sweyolakan on Lake Coeur d'Alene, the three-day, two-night event encourages professional adults in the design and marketing industries to let loose and get back in touch with their imagination. Registration for the 2016 version of Collective Campout opens next Friday, April 1, for AAF Spokane members. The general public can register (if any of the 100 spots are still open) starting on May 1. Early-bird registration is $200 (on May 1 that cost goes up to $250), which covers lodging, food and access to three workshops, along with pre- and post-workshop team-building sessions. Collective Campout's 2016 keynote speaker and guest is prominent Portland-based graphic designer Von Glitschka. He'll present on Friday night and will work alongside participants throughout Saturday's workshops, says event co-chair Mellie Price. More creative workshops are being offered this year, Price adds. Attendees can choose three out of 12 sessions, compared to a total of nine last year. One of those new options is a team-building ropes-course session. Workshops led by local artists, writers, designers and photographers are intended to push people outside their creative comfort zones and to allow collaboration that otherwise might not happen. Price hopes the camp will sell out all 100 available spots, especially considering the shared excitement of Collective campers last August. "One of the things that was so awesome to see when we left camp was that moment everyone got their wifi back, and there was just this outpouring between all the campers," she recalls. "Our goal was to make our community more accessible — we're all in this together as Spokane creatives — and watching that happen; friending on Facebook, sharing and updating resumes and going out and buying art supplies, that was the point where we're like 'OK, this needs to happen again.'"